Chinese characters were (and still are) the biggest obstacle for me in learning Chinese. The other things that you always read about being difficult like Pinyin and Chinese pronunciation never seemed that bad to me. It was the characters that really challenged me the most. It was always difficult to know if the characters in my textbook were ‘really the ones you needed to know‘. Just to give an example, in the lesson about going to the doctor, we learned the characters for sneeze (喷嚏), which you would never really see outside this particular context, and even a lot of Chinese people, if you ask them, might have trouble writing uncommon characters like this from memory. When I was dabbling with Russian at school, I managed to find my way around texts a bit better by learning some vocabulary from the most frequently used Russian words list. I found it really hard to remember the words just from a list, but it gave me a bit of a short term boost. I couldn’t help wondering if I could do the same thing with Chinese, and I found the most frequent Chinese characters list, which was based on research by Jun Da, a professor in the US. 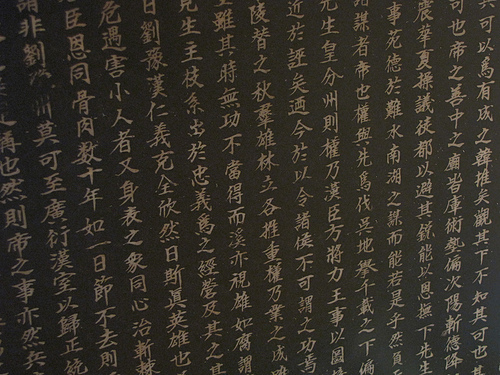 According to the research, learning the first 500 characters gives you 50% coverage of modern Chinese, 1000 characters gives you 89%, 2000 gives you 97% and 3000 gives you 99.2%. One of the things that I did to learn Chinese characters was learning the characters from this list. After the first year or so I knew 1500, later I got to 2000 and then I managed to make 3000 (years later, I learned the meanings of the characters up to 3600, but by that point they were getting very obscure, I certainly can’t write anything like that many). But what did learning these characters do for me? Well, first of all, very slowly, it gave me a confidence boost, because just being able to recognise more characters in texts made me feel there were not so many that I didn’t know. I didn’t have to look characters up in the dictionary all the time, and even though I maybe didn’t understand all the words, I felt like I knew more. Moving towards a solid goal helped to motivate me. Quantifying things made it easier to set targets and work towards them. The other thing it did was help me to move through texts easier and understand the gist better. People say that learning characters doesn’t mean you know words, which are often made up of two characters. That’s true, but it does make it easier to learn words, and often to guess the meaning. So, for example, if you don’t know 解开 is unfasten, but you know 解 is release and 开 is open, then you can probably guess the meaning, or if you know that 陈 on its own means ‘lay out’ and 述 means narrate, then you might be able to figure out that 陈述 means state or declare. Even if you didn’t know 口水 was spit or saliva, just seeing the characters mouth and water would make it clear. So does learning the most frequent Chinese characters actually work? The answer is yes it does, but it’s not enough on its own. You still need to pick up words as you go along and figure out how characters are put together, however it can help you to fast track things. The best thing to do in my experience is to learn characters from your textbook or course (the meaning, pronunciation and maybe how to write them) as you go, and use the frequent characters list as flashcards or work through as one activity you do to fill in gaps in your knowledge and boost your reading comprehension. Chinese is not exactly like European languages in that words are made of very clear parts (the parts are not always clear in other languages) and the characters in turn are made up of smaller components. Learning the characters as individual items as well as in words can really help you to piece things together.